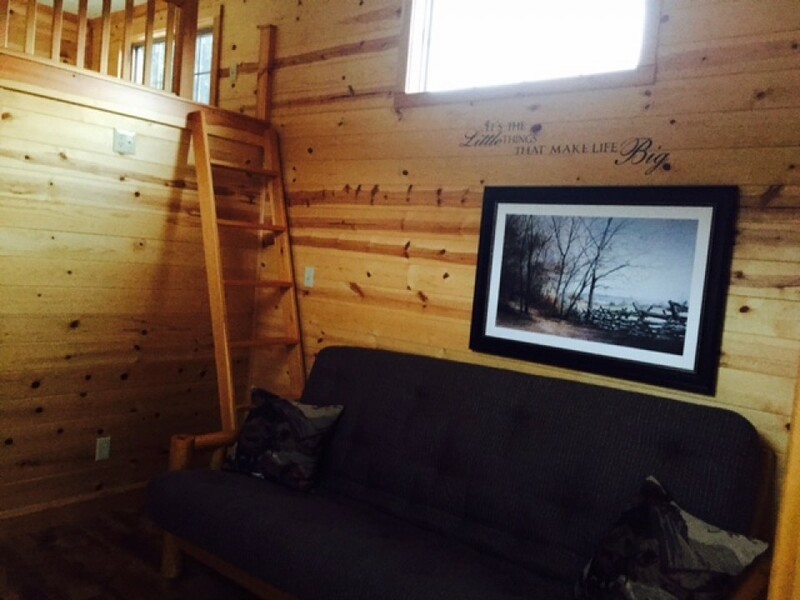 Royal Wulff – 1 Bedroom Cabin with Loft – $180.00 per Weekend night (Friday & Saturday). $125 per Weekday night (Sunday – Thursday) $1,015.00 weekly. Rates are based on 2 Guests. Children under 10 are free. Maximum occupancy of 4. After a long ride and the memories of an overwhelming workweek fade, you arrive at the Royal Wulff cabin. As you enter across a covered front porch with rocking chairs, you can’t help but notice the country charm that this well appointed cabin offers. 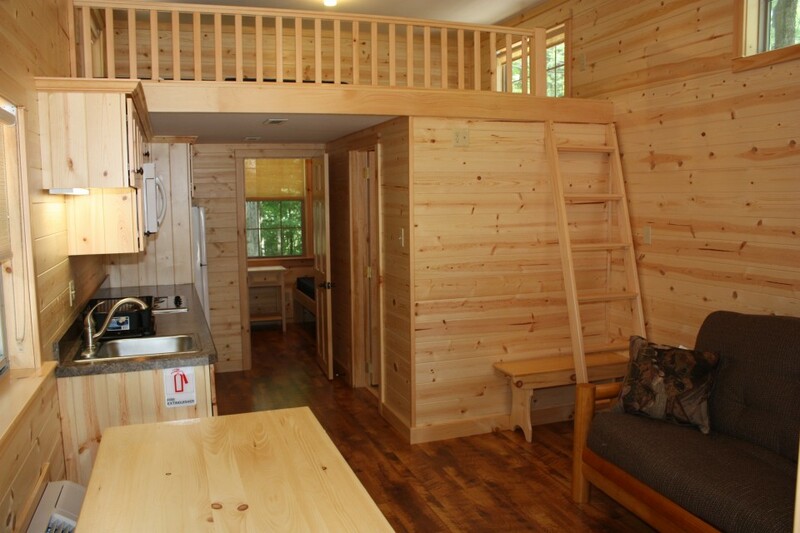 Its amenities include living quarters with a fold out futon and flat screen cable TV. In the master bedroom, a Queen size bed and a flat screen cable TV are available. Guests can enjoy a private bathroom with shower and flush toilet. A fully equipped kitchen with a loft above for the kids to set up their own base camp. Here they can play a favorite game or gaze out the sky windows as they wait for a shooting star from their sleeping bags. 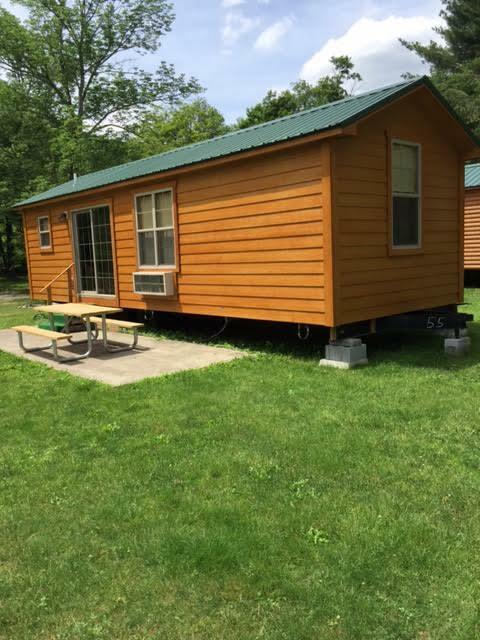 Green Drake – 2 Bedroom Cabin – $195 per Weekend night (Friday & Saturday). $125 per Weekday night (Sunday – Thursday) $1,015.00 weekly. Rates are based on 4 Guests. Children under 10 are free. Maximum occupancy of 6. 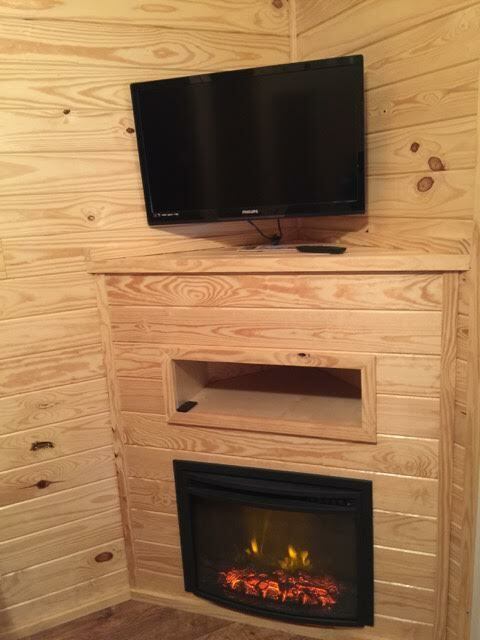 You can’t help but feel that you never left home when you discover all the amenities our Green Drake cabin has to offer. Our Forest Glen is larger in size and features two bedrooms at opposite ends of the unit for maximum privacy. The master bedroom features a Queen size bed and a flat screen TV with cable. 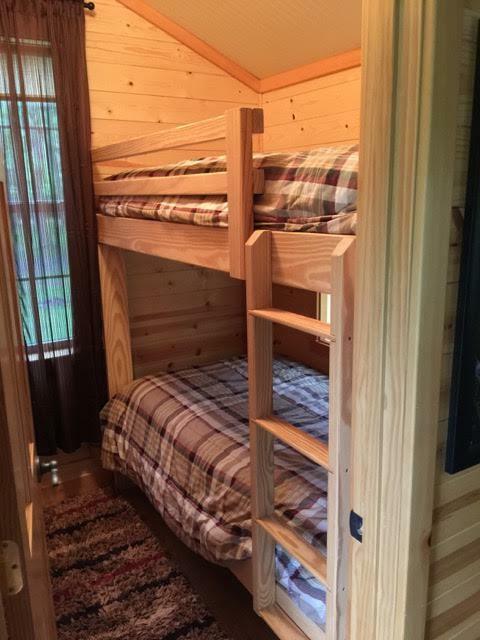 The second bedroom has bunk style beds with a double bunk on the bottom – ideal for children. Enjoy your private bathroom with shower and flush toilet. Prepare your favorite full course meals in your fully equipped kitchen. Nestled between the two bedrooms is the living room, which includes a flat screen cable TV and a comfortable hide-a-bed sofa. Enter and exit the cabin through the living room’s double glass sliding doors. 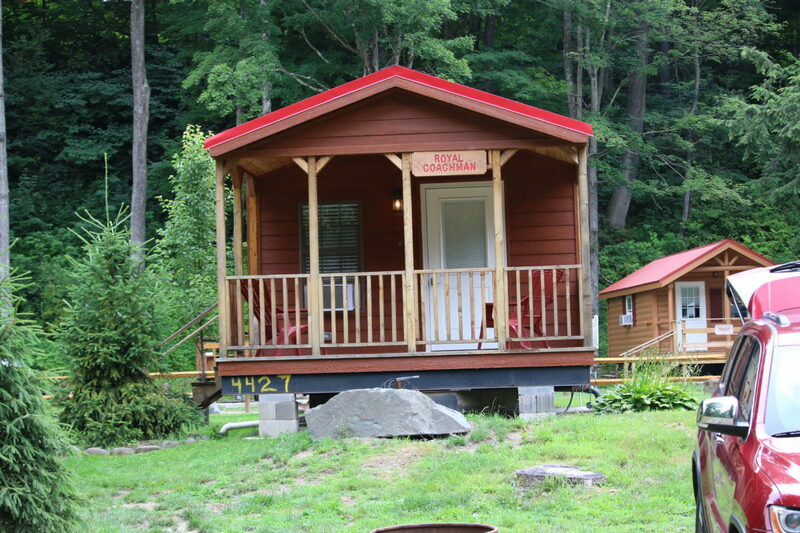 Royal Coachman – 2 Bedroom PET FRIENDLY Cabin with Loft – $195 per Weekend night (Friday & Saturday). $125 per Weekday night (Sunday – Thursday) $1,015.00 weekly. Rates are based on 4 Guests. Children under 10 are free. Maximum occupancy of 6. 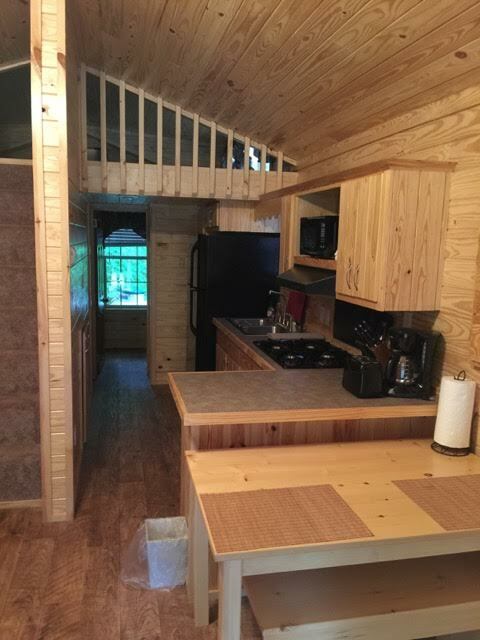 For those who desire to have all the modern conveniences of home while camping, the Royal Coachman cabin is the place for you. 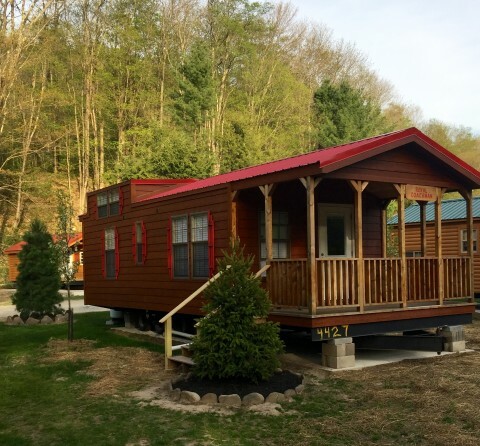 This home-away-from-home is beautifully furnished with a cozy electric fireplace in the living room, which also has a flat screen cable TV and a comfortable hide-a-bed sofa. Guests have a private full bathroom with shower and regular flush toilet. A Queen size bed and flat screen cable TV can both be found in the master bedroom. 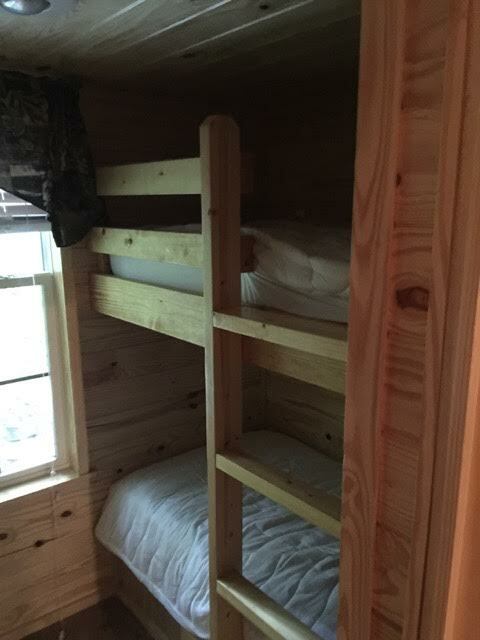 The second bedroom has two single bunk beds. 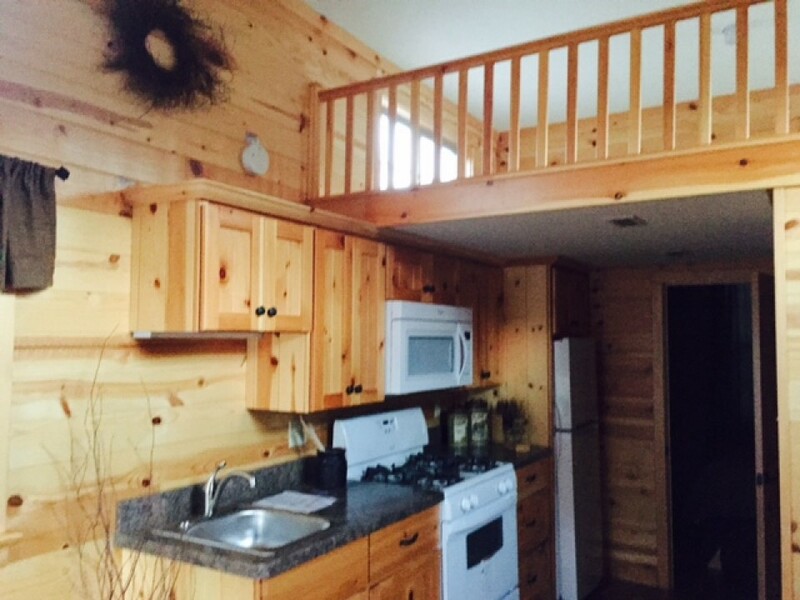 Located above the fully equipped kitchen is a spacious loft area for the kids to roll out their sleeping bags or play their favorite games. And lastly, at the front of the cabin, a covered front porch awaits guests as they enjoy the peaceful sounds of the great outdoors. 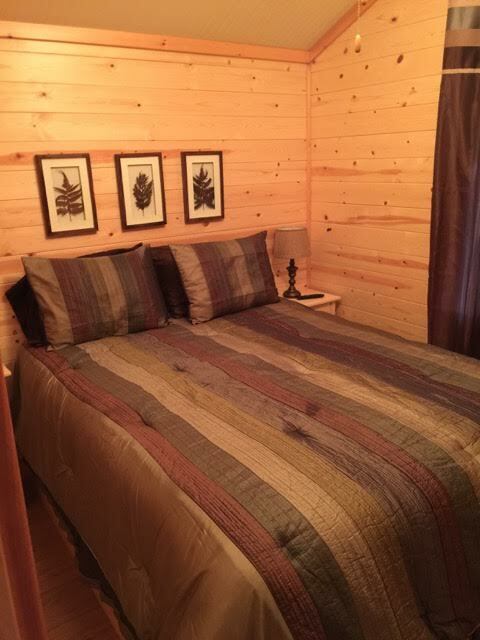 Cahill – 2 Bedroom Cabin – $195 per Weekend night (Friday & Saturday). $125 per Weekday night (Sunday – Thursday) $1,015.00 weekly. Rates are based on 4 Guests. Children under 10 are free. Maximum occupancy of 6. 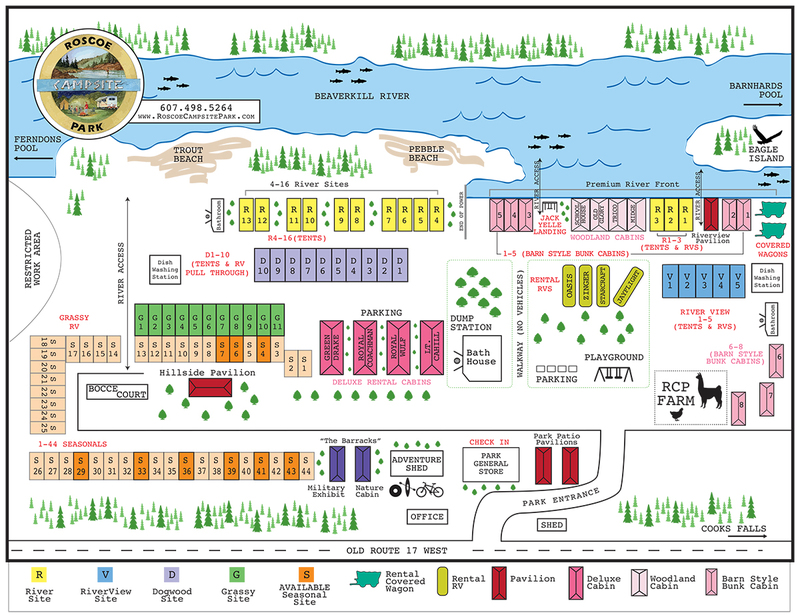 The Cahill Adventure is centrally located in the park. 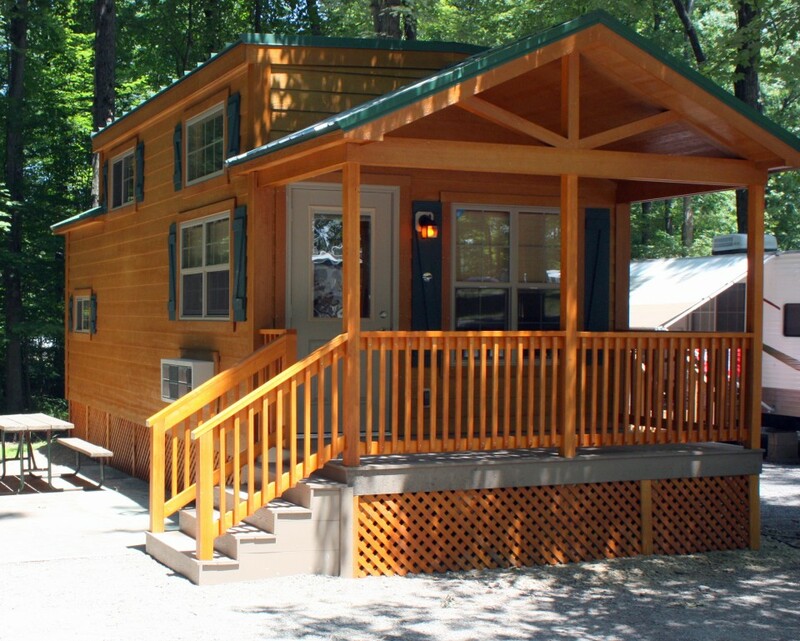 This layout is a family favorite with its bedrooms located on opposite ends of the cabin. Its amenities include a living room with a pull out futon and flat screen cable TV. In the master bedroom, a Queen size bed and flat screen TV are there for you to enjoy. 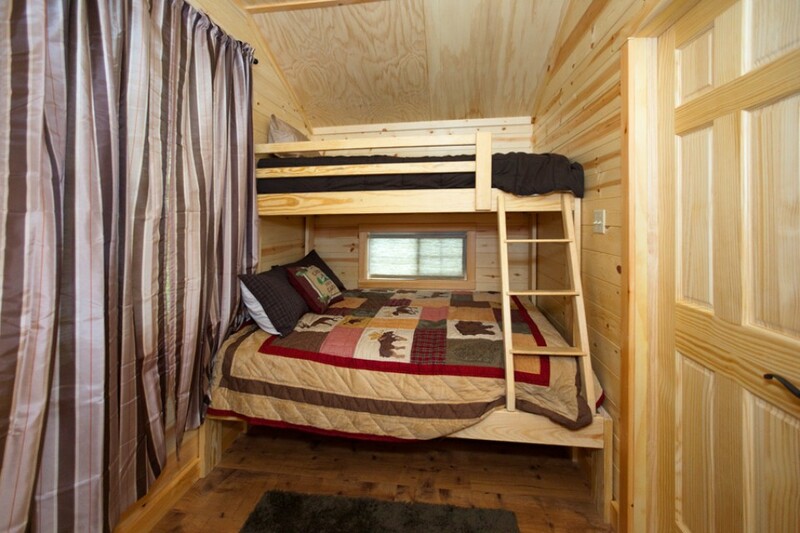 The second bedroom has bunk style beds – ideal for children. 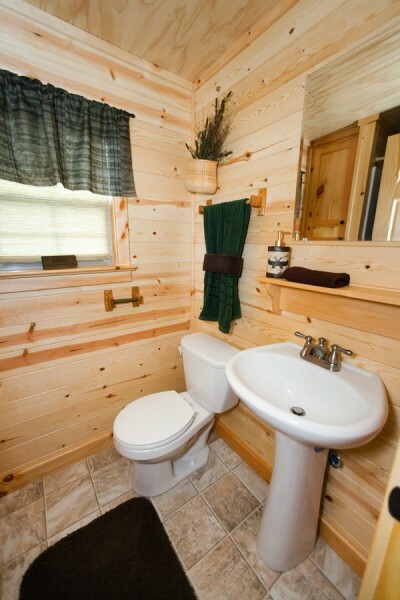 Guests can enjoy a private full bathroom with home style flush toilets and large size shower. This location is a favorite to have your evening fire watching out for a shooting star in our spectacular sky’s in our mountain valley.